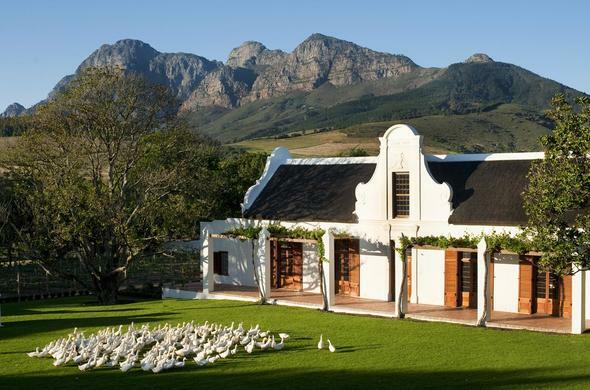 Babylonstoren is a one-of-a-kind historic farm hotel located in the scenic Drakenstein Valley between Franschhoek and Paarl in the Cape Winelands. Babylonstoren is a 240 hectare working wine farm that dates back over 300 years. This luxury farm hotel located in the Drakenstein Valley accommodates guests in stunning, eco Cape Dutch-inspired suites among vineyards and groves. The designs are inspired by 17th and 18th Century Cape Colony buildings but features modern, luxurious amenities and facilities. At Babylonstoren, unique and authentic Cape Winelands experiences include dining at the Babel Restaurant, visiting the Greenhouse and sampling wine and of olive oils on the hotel premises. Bird enthusiasts are in for a treat as domestic fowl and snail-harvesting ducks can be witnessed in all their glory. Babylonstoren is also located near other wine producing farms in Stellenbosch and Franschhoek, and serves as the perfect base for a Cape Winelands tour. Babylonstoren is situated away from the hustle and bustle of the city, making it the perfect farm hotel escape.